Israeli Prime Minister Ehud Olmert says he hopes to revive long-stalled peace efforts with the Palestinians, as a ceasefire takes hold in the Gaza Strip. In a major policy speech, Mr Olmert pledged humanitarian and economic incentives if militants freed a captive Israeli soldier and violence ceased. The speech comes against a backdrop of increased international diplomacy. Palestinian Authority President Mahmoud Abbas's aides said talks should resume immediately and unconditionally. But officials from the militant Hamas party, which won parliamentary elections in January, expressed suspicion about Mr Olmert's statement and demanded an end to military action in the West Bank and Gaza. Hamas government spokesman Ghazi Hamad called Mr Olmert's statement a "conspiracy" and "a new manoeuvre". "Mr Olmert is speaking about the Palestinian state without giving details about the borders," Mr Hamad said. 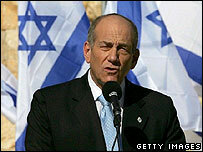 The US has welcomed what it called a "constructive" speech by Mr Olmert. "I think this, combined with the announcement of a ceasefire, are certainly welcome developments, certainly potentially promising," said state department spokesman Sean McCormack. The official Palestinian news agency said the woman was shot as she went to the aid of an injured militant from the Popular Resistance committees. 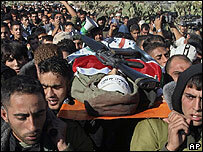 The Israeli army said she had been trying to recover his gun. Under the ceasefire which came into force on Sunday, Palestinian militants have agreed to stop rocket attacks on Israel, and Israeli troops withdrew from Gaza. However, rockets have continued to be fired, the latest attack hitting the Israeli border town of Sderot on Monday afternoon. There were no reports of injuries. Mr Olmert said Palestinians would see substantive improvements in their lives if they chose the path of peace. Mr Olmert spoke of releasing many long-term Palestinian detainees in Israeli jails, lifting restrictions on the occupied territories, dismantling settlements and ultimately creating a viable state. However, he also warned of the dire consequences if violence continued. He was speaking at an annual memorial at the grave of Israel's founding premier David Ben-Gurion in the southern Negev desert. The BBC's Jon Leyne in Jerusalem said all Mr Olmert's pledges have been made before, but their importance lies in the context in which they are now being made. Another chance is being given to the Palestinians. If they don't take it they will end up a broken people. The last four months have seen an upsurge of violence in the Gaza Strip which has killed more than 300 Palestinians, including scores of civilians. Five Israelis have also died. Mr Olmert won elections in March on a pledge to make further unilateral withdrawals, but credibility in the policy was dashed in a summer of conflict in Lebanon and the Gaza Strip. Hamas won election on a platform of not recognising Israel's right to exist. Israel has ruled out political engagement with the Palestinians until Hamas softens its stance.